Recruiting for Prelude – OPMS Online Application Interview with Erica Gray, Kuiper Australia – Online Personnel Management Systems Pty Ltd. In 2017, when the recruitment for Prelude project was about to commence, Erica approached me and requested that we help Kuiper to improve the application process. A large volume of applicants was anticipated for the project. At the time, we were interfacing with clients’ online applications, however managing various external applications was difficult and expensive for our clients, especially when changes were required. Our aim was to develop two new features for OPMS – the generic, easy to use online application and a verification bay for the recruiters to work through the applicant pool. The Prelude project became the deadline. I asked Erica a few questions about the project and if it delivered the desired results. Q: You were very interested in us developing an online application and became a driving force in this project. Why was it important for you? Efficiency was, and remains, a huge focus for Kuiper. Developing an online application process was extremely important, as we were a small team in a rapidly growing business and were about to undertake our largest recruitment drive. Providing a platform where candidates could lodge an application and update their details as needed was, in my mind, an absolute necessity. Without an online portal, I would have required additional staff to manage the increased correspondence with candidates, and the manual entry of applicant details into OPMS, at significant time and financial cost to the business. Q: To my knowledge, it was the first time Kuiper used an online application rather than collecting CV’s from candidates via email. On the first weekend the application form went live, you received about 700 applications. It was an exciting day in our office; was is daunting for you? 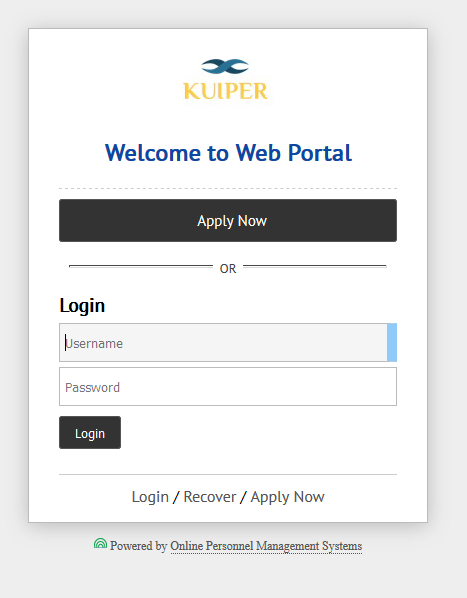 While I had used established Applicant Tracking Systems in previous roles, this was the first time we were using an online system at Kuiper. I was nervous for several reasons; not only were we the first users of a brand new system without a track record, it coincided with our largest recruitment drive for which we had extremely tight timeframes. Had something gone wrong, there was the potential for a significant impact on our business. The fact we received so many applications on the first day clearly shows the system was required, and that it was the correct tool for our business. Trying to manage 700 email applications in the space of a day would have been a nightmare. As with any new system, there were a couple of bugs, but OPMS team ensured these were quickly resolved, and swiftly worked to improve the system based on feedback provided by Kuiper, and our candidates. Q: In retrospect, how did it change your recruitment process and what key benefits did this project deliver? The new application process significantly changed our recruitment process, in exactly the way we needed it to – it allowed us to move away from the archaic “send us your CV” approach, and instead asked applicants to submit a comprehensive online application. While there is always room for improvement, the new online system delivered the main benefits I was initially looking for, and also delivered the efficiency we needed – saving us time and money. Provides candidates with the reassurance that their application had been received, and has not disappeared into a black email hole. Hence, less calls to the office to “check if you got my CV”. Any online application system does create more work for the candidate, and sometimes this may be an obstacle, but it is also reassuring that every candidate is willing to put in a small amount of effort to register their interest in the project, and Kuiper. We are keen that every candidate has a positive recruitment journey, even if they are not successful in their application, so the system has to be easy to use. Q: You have personally trained all your new starters to use the applicant’s pool in OPMS. Do users pick it up quickly? Yes, everyone has been trained how to process and import applications from the candidate pool. It was easy to pick up, and it much quicker than the old process of manually creating new candidate profiles. Q: Would you recommend the transition from collecting CV’s via email to receiving online applications? Absolutely. For any company which still receives applications via email, I would definitely recommend switching to the online portal. Q: Lastly, thanks from our whole team for providing the guidance and drive to implement these new features. We’re planning to introduce more new features within the Recruitment module in the future. I’ll be sure to get your feedback again to ensure what we deliver will work for both, large and small recruitment campaigns. Thanks Tiiu, I look forward to seeing the new features as the service continues to evolve.